Honor the Nuclear Whistle Blower’s birthday by mailing a card to the three judges in Israel and your political representatives to FREE VANUNU NOW! YNet photo of Vanunu outside of a place he really never left. Their latest bulletin calls for members to send cards and letters to local politicians and the Israeli Supreme Court the simple message: FREE VANUNU NOW!!! Thank you, your name, state/country. Salem-News.com’s staff reporter Eileen Fleming has been reporting on the Vanunu saga since 2005 and relates that on 3 October, three Israeli Supreme Court Justices denied Vanunu’s latest appeal to lift the restrictions that hold him captive in Israel. On August 13th the Court was to render decision on Vanunu’s other appeal to have his citizenship revoked but no decision has been made public. "Vanunu told the world that Israel had developed between one hundred and two hundred atomic bombs [in 1986!] and had gone on to develop neutron bombs and thermonuclear weapons. Enough to destroy the entire Middle East and nobody has done anything about it since. "-Peter Hounam, 2003 for The BBC. Vanunu turns 57 on the 13th of October and Salem-News.com will not wish him a ‘happy birthday’ but a final birthday in an open-air prison with wishes and prayers for decades of more in full freedom. 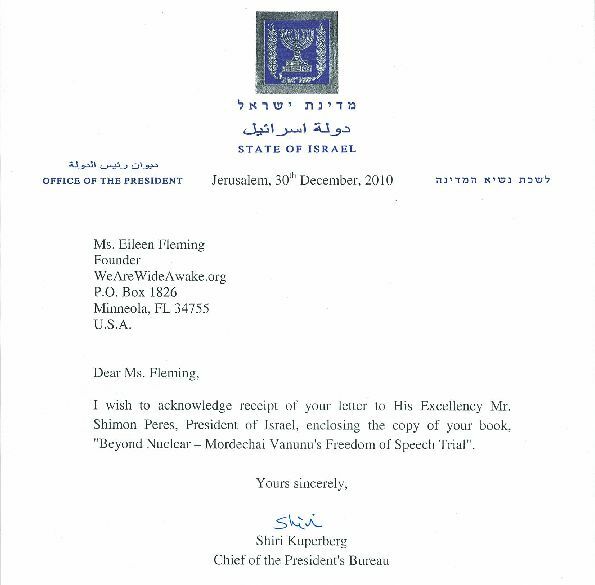 Wishes and prayers do come true when wedded to action and invites all its readers to honor the Nuclear Whistle Blower’s birthday by mailing a card to the three judges in Israel and your political representatives to FREE VANUNU NOW! An online version of this letter was published first and disseminated from my website http://wearewideawake.org/ on 6 October 2011. Your Oct. 6th decision to continue to deny Mordechai Vanunu the freedom to leave the state admits, "The court cannot be blindfolded and ignore what is happening in front of its eyes” and so I write you to inform you that I was not a reporter when I met Vanunu in 2005; but I became one when we began a series of interviews that culminated in my third and the enclosed book. The prosecution charged that Vanunu should not be allowed to leave Israel for he posed "a real danger to the security of Israel” while the Judges stressed Vanunu had contacts with unspecified "foreign elements." 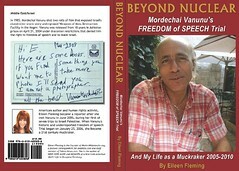 I want you to know that Vanunu “fired” me as a friend and supporter on Face Book as well as in real life within three days of the publication in Oct. 2010, of BEYOND NUCLEAR: Mordechai Vanunu's FREEDOM of SPEECH Trial and My Life as a Muckraker: 2005-2010; but as an act of conscience and sense of mission, I have –and will-continue to report on the ongoing saga of Vanunu until he is free to leave Israel. I want you to know that ever since Vanunu quit talking to me a year ago, I have garnered all my information about him from his You Tube Channel for Vanunu became his own Media with the upload of Vanunu Mordechai Freedom of Speech, about all world Media, May 23-2010. "This is the secret that hasn't yet been told in the affair: the story of the security fiasco that made it possible for Vanunu to do what he did, and the story of the subsequent attempts at cover-up, whitewashing and protection of senior figures in the defense establishment, who were bent on divesting themselves of responsibility for the failure. "Shortly after taking office as chief of security at the Defense Ministry, Yehiel Horev began to take punitive measures to hobble Vanunu. He is responsible for the harsh conditions in which Vanunu was held, which included years in solitary confinement, and the sharp limitations on the number of visitors he could have…[and has fought] a rearguard battle to prevent Vanunu from leaving Israel and to place him under supervision and restrictions that will be tantamount to house arrest. Horev has always been considered the strictest of all the security chiefs in Israel, especially in regard to the protection of institutions such as the Dimona facility and the Biological Institute…all the hyperactivity being displayed by Horev and those who support his approach is intended only to divert attention from what has not yet been revealed: the security blunders and their cover-ups." Vanunu told me, "All the secrets I had were published in 1989 in an important book, by [Nuclear Physicist] Frank Barnaby, “The Invisible Bomb: Nuclear Arms Race in the Middle East." Barnaby testified, "I found Vanunu very straightforward about his motives for violating Israel's secrecy laws he explained to me that he believed that both the Israeli and the world public had the right to know about the information he passed on. He seemed to me to be acting ideologically. "Israel's political leaders have, he said, consistently lied about Israel's nuclear-weapons programme and he found this unacceptable in a democracy. The knowledge that Vanunu had about Israel's nuclear weapons, about the operations at Dimona, and about security at Dimona could not be of any use to anyone today. He left Dimona in October 1985." The restrictions that have subjected Vanunu to 24/7 surveillance [his movements, phone calls and emails] ever since 21 April 2004 come from the Emergency Defense Regulations, which were implemented by Britain against Palestinians and Jews after World War II. Attorney Yaccov Shapiro, who later became Israel's Minister Of Justice, described the Emergency Defense Regulations as "unparalleled in any civilized country: there were no such laws in Nazi Germany." Israel also kidnapped Vanunu in 1986, but Article 9 of the International Covenant on Civil and Political Rights states: "No one shall he subjected to arbitrary arrest or detention", including abduction of a person by agents of one state to another state. In 1987, Vanunu was convicted of "Aggravated Espionage, High Treason and Assisting the Enemy." In May 2011, he petitioned the court to honor its own law and revoke his citizenship which is found by scrolling on You Tube Vanunu Mordechai asking, CANCEL, Revoking my Citizenship-MAY 5-2011. 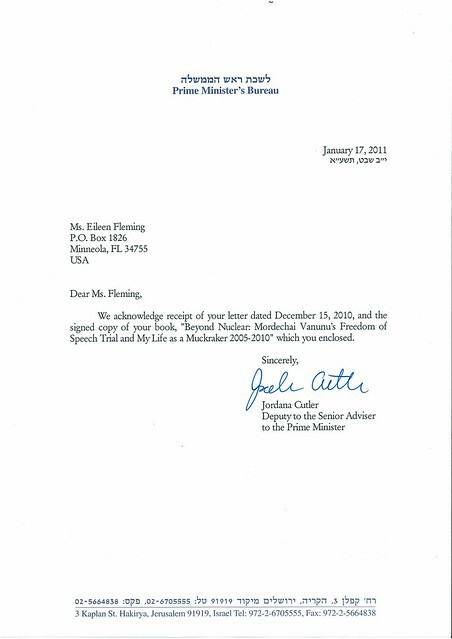 I have petitioned my government on this topic many times via email, fax and phone calls, but neither President Obama or Secretary of State Clinton have responded in support of Vanunu’s human rights; and thus this document also serves as my public petition pleading with Israel to listen to their prophets, such as Micah in 6:8 and FREE VANUNU NOW! "What does God require? He has told you o'man! Be just, be merciful, and walk humbly with your Lord." Copy of BEYOND NUCLEAR for each Justice. Producer "30 Minutes with Vanunu" and "13 Minutes with Vanunu"
In Solidarity YES WE CAN begin the world again. i will send a card! wonder how these people can live with themselves inflicting this injustice? Typo correction: In May 2011, he petitioned the court to honor its own law and revoke his citizenship which can be found scrolling on You Tube "Vanunu Mordechai asking, CANCEL, Revoking my Citizenship-MAY 5-2011".